Kid Says: Mooooooom, I’m tiiiiiired. I don’t want to go to schoooool. Mom Says: Any idea why? Maybe you should go to bed at bed time? Mom Thinks: I got a third of the sleep you did and I think I might just scream, cry or both. Mom Says: Hey, look at your awesome lunch. Kid forgets to be tired and gets ready for school. Mom forgets to scream and cry and dances around the kitchen instead. So let me tell you what made me dance this week. I just received the Yum-Yum Bento Box book and was inspired to start the new year off right. I started off with a caterpillar rice ball. For instructions on making rice balls, go HERE. 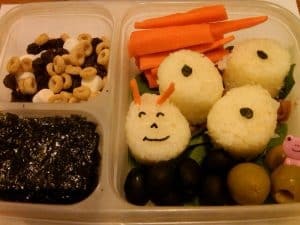 I made the sushi rice in my cheap little Aroma Rice Cooker and used a round-ish Sushi Rice Mold to make 4 circles for my caterpillar. I used a Nori Punch to decorate the caterpillar and added some carrot antennae. Instead of filling the rice ball, I placed them on top of some spinach and refried beans. (Yes, we call this Japanese Mexican fusion. 😉 ) I added carrots, olives, roasted nori and some super “fancy” trail mix with Cheerios, raisins and left over holiday marshmallows. For the next lunch, we repeated our favorite frog rice ball lunch. The trick to making them green is to add rice, water and food coloring before you press “cook” on the rice maker. 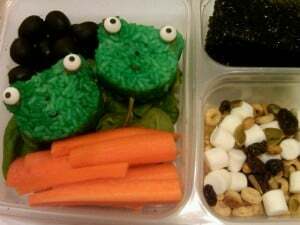 I used the Bear Sushi Rice Mold but put the Candy Eyes on the “ears” to make it frog-like. I used the Nori Punch to make the mouth and nose. Again I added refried beans behind the frogs along with spinach carrots, olives, roasted seaweed and super fancy trail mix. In the lunch bag I also include a fork and napkin. Later in the week we switched to hard boiled eggs. According to my kids, the only correct way to prepare a hard boiled egg is with a crazy shape. Not wanting to disappoint, I made heart, flower, car and fish shaped eggs. To make crazy hard boiled eggs, follow our instructions here. You just boil eggs as normal but take off the shell while they are still warm. Put the egg in the mold and then pop it in the refrigerator or in ice water. Once it is cool, the egg will hold its crazy shape. 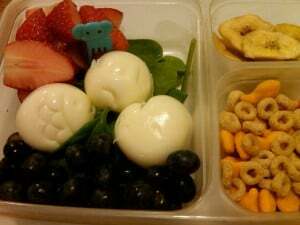 I added spinach, strawberries, blueberries, banana chips and super super fancy trail mix (with Cheerios and Gold Fish). I added the Elephant Food Pick to make it fun to eat. The lunches were popular and the kids were excited to take them to school, despite the early mornings and the hard adjustment from our lazy holiday vacation. I’m calling it it a successful week and am dancing around the computer right now! Things to do in Houston, with kids, this weekend! January 11, 12, 13, 2013!